Escape from the crowds, buses and tour boats to see Maui from an ocean perspective! No more than 8 guests per guide. 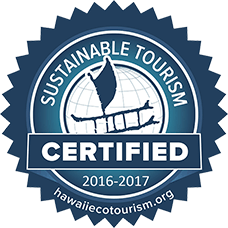 Our Eco-Certified Maui Kayaking Tours allow you to experience Maui’s delicate marine world while helping to preserve it. Our guides cater to all ages and abilities, creating a fun and safe day for the entire group. Enjoy Kayaking Olowalu, Snorkeling Turtle Town or Exploring Honolua Bay. Snorkel gear and Digital photography included!! 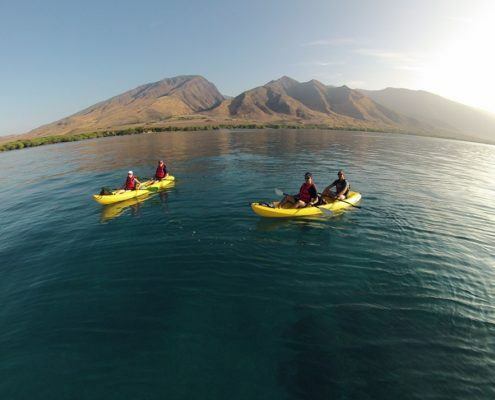 Kayaking is the best way to snorkel Maui’s secluded spots away from the large tour boats. 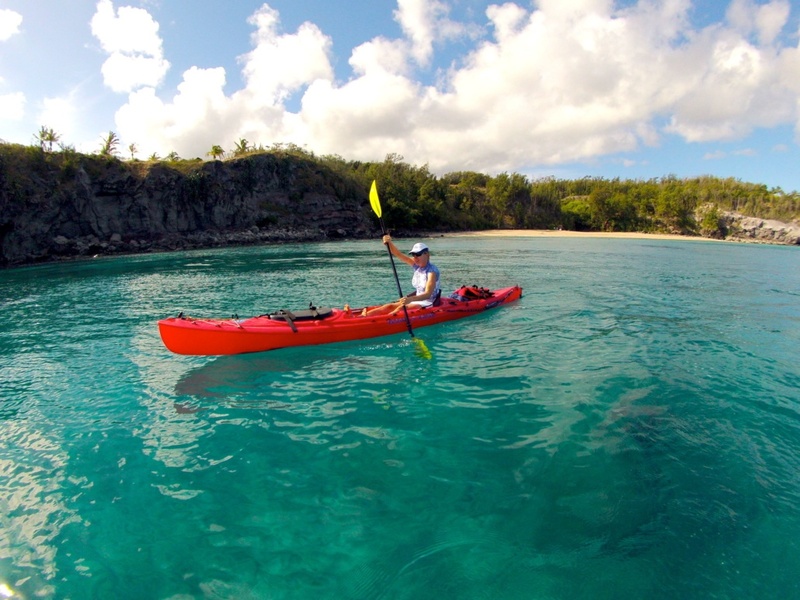 Connect with nature as a Certified Marine Naturalist Kayak Guide snorkels with you pointing out Hawaiian Green Sea Turtles (honu), tropical fish and other abundant marine life. Free Digital Photos! 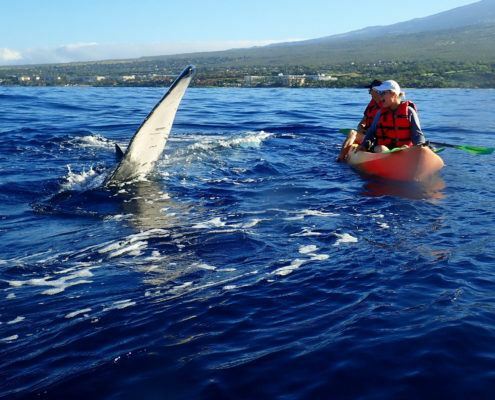 Maui Kayak Tours are a great alternative for Whale Watching. Unlike large commercial boats, everyone has a front row seat! 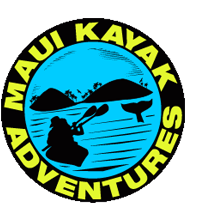 Our Marine Naturalist kayak guides locate Humpback Whales and sometimes Dolphins while paddling along side you, ensuring a safe memorable Maui experience. Discover Maui’s best kept secret! 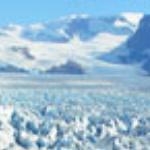 For your premier kayak, snokel and whale watching adventure. We take you to the best locations off Maui that are nothing short of spectacular! 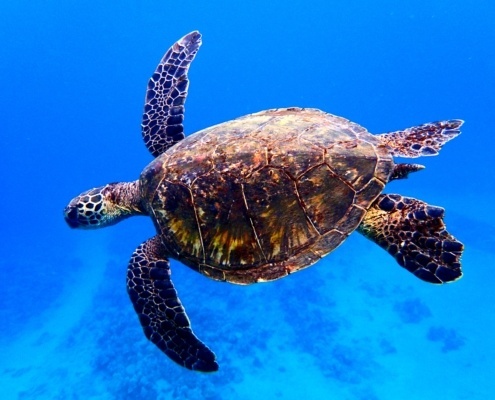 In the heart of the Makena Coastline is the iconic “Maui Turtle Town”! As you can gather from the name this area, on Maui’s southern shore, is very populated with Green Hawaiian Sea Turtles. However, Turtle Town is not one reef, its a several mile long stretch of ocean that encompasses more than a dozen reefs and snorkel spots. Most of the LARGE snorkel boats go to the same two reefs in Turtle Town, and we’ll definitely keep you away from them! On a kayak snorkel tour in Turtle Town your guide has flexibility to take you as far or close as you want to paddle to see Green Hawaiian Sea Turtles. During our winter months, December through April, the calm waters off of Wailea make this a great option for whale watching. Enjoy beautiful views of Haleakala, Puu Olai, Molokini Crater, Lanai, Mauna Ka Halawai (West Maui Mountains) and Hawaii (the Big Island) on a clear day. Not to mention a new perspective of South Maui’s famed resort area of Wailea and Makena. 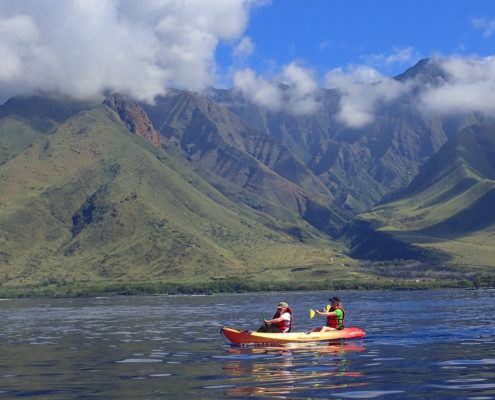 Kayaking at Olowalu beneath the back drop of Mauna Ka Halawai, or West Maui Mountains as they are commonly referred is a great choice year round. 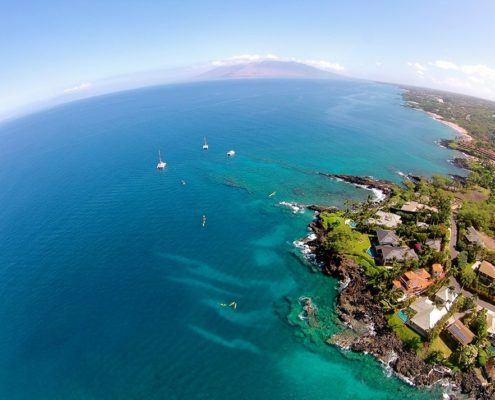 Enjoy views of Haleakala, Molokini Crater, Kahoolawe, Lanai, Molokai and Hawaii (Big Island) on a clear day!! Enjoy secluded whale watching, away from the large whale watch tour boats and BIG group kayak companies swarming Makena and Wailea, during our winter months of December through April. The rest of the year Olowalu Reef, or “Mile marker 14” as its sometimes known by visitors who are told to look for the marker to pull off the highway and snorkel, offers incredible snorkeling and is home to some of Hawaii’s healthiest reef system. A turtle cleaning station is frequently visited by Green Hawaiian Sea Turtles looking to have their shells cleaned by the tropical fish and cleaner shrimp in the area. Large schools and a variety of colorful reef fish make this one of Maui’s visitors favorite place to snorkel. Kayaking in Kapalua on Maui’s upper west side is like taking a step back in time to old Hawaii. We leave from Honokahua beach, commonly knowns as DT Flemmings, in front of the Ritz Carlton Kapalua. Limited development and the recent preservation of coastal land has left the rugged coastline of Kapalua nearly untouched. As you enjoy a strong paddle through headwinds to Mokuleia Beach and bay, commonly known as Slaughter House, you’ll find sea turtles popping up along the way to warm their shell in the sun or eating algae from the lava rock outcroppings. Spinner dolphins also sometimes join us for our paddle around the corner to Honolua Bay, translated as “Two Bays”, which was designated as a Marine Life Conservation District in 1978. Enjoy an abundance of tropical fish while snorkeling in these protected bays, tucked away from the wind. Speaking of the wind, we won’t shy away from the fact that this isn’t the ideal location for everyone.A strong head wind makes for a challenging paddle to Honolua Bay, but if you can make it there you’ll definitely be rewarded with a marine life along the way and while snorkeling. The raw-ness of Kapalua is where its charm and beauty lay, as the saying goes… “no rain, no rainbows”. So if you’re looking for calm, sunny conditions, please talk with us about one of our other locations. Offered in the summer months of June, July and August only. Everyone knows that when it comes to the best whale watching in the world Maui is the top of the list. However (fortunately for you) only a select few know the best way to get you there is on a self-powered kayak! No engine or crowd noise, no diesel fumes…. just you, the swoosh of your paddle through the water and the Humpback Whales! 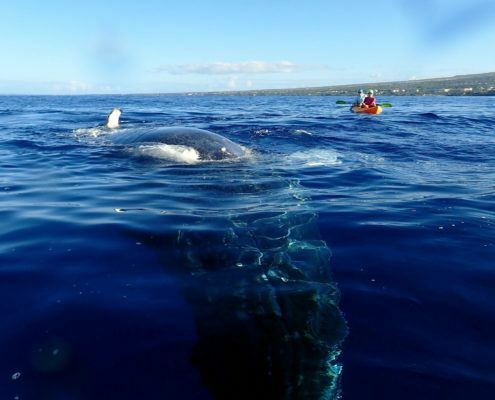 There just isn’t a comparable experience to seeing a humpback whale up close and personal on an ocean kayak. Sometimes you can even hear their singing echoing through the hull of your kayak. Our knowledgeable staff can guide you in the right direction, based on current weather and whale sightings, for the best location of your kayak whale watch adventure. Our passionate ocean guides are marine naturalist certified and have a ton (pun intended) of information to share with you about Humpback whale migration, population, behaviors and more. Booking a private kayak tour over a group tour allows you to call the shots and not worry about other guests agendas. Whale Watching Kayak Tours are offered January through March, but check with our team to see if there is a chance to catch a whale on your tour! Took the 3 hour group Makena landing tour. We also did the road to Hana, Feast of Lele Luau and Pearl Harbor tour, All fantastic. But all these activities did not compare to the Makena Landing tour. This is a must do. Your guide will be lead you on a great adventure/ education of marine and Hawaiian life style. We went out on a morning when the full moon from the night before was still up; the water was beautiful! Not only did our guide teach our group some things about the islands, language, whales, we also got to be active! Lots of fun coupled with breathtaking scenery from above and below. Our guide Mike was outstanding and shared his knowledge of both the ocean and the creatures that call the water home. We will definitely book again when we return to Maui next year.